We bring to you not-difficult-to-filter cute moments from the past year which prove he totally deserved a doll being designed and sold after him. Baby Nawab is an internet sensation already before he turns two today. Father Saif Ali Khan, in this season’s episode of Koffee With Karan, revealed the humongous amount of money that a paparazzi makes for every photograph of his dear little munchkin. 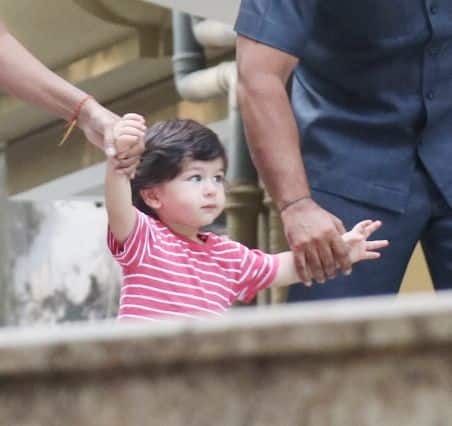 While grandmother Sharmila Tagore feels a little annoyed with all that media attention that is being radared on him, we felt a small sense of personal achievement when, at a recent outing, Taimur ran towards the shutterbugs mumbling (what we believe to be) the word “media”. As the dollop of cuteness rings in his second birthday today with parents Kareena Kapoor Khan and Saif in South Africa’s Cape Town, we bring to you not-difficult-to-filter cute moments from the past year which prove he totally deserved a doll being designed and sold after him. Help us decide who’s shining more in this picture – The rosy sun or our fresh as dew child Taimur as he poses with uncle Ranbir Kapoor. Also, we are in a dilemma as to who should be rated as the bigger star. Earlier this year, filmmaker Karan Johar shared a video of the Pataudi kids chilling with his twins as mother Kareena typically indulged in a plate full of delicacies. Of course, our hearts skipped a beat when we first set eyes upon Taimur’s dard-e-disco style pony as he peered earnestly at his dad’s photograph in the frame that he held with both hands. Oh we are not done yet. See a couple more of the public experiences of our tiny tot who is far from being intimated by the camera and you’ll believe the genes had toughened his camera presence already. Finally, here comes our favourite video where we believe Taimur called out to us in joy. The royal kid has taken internet in a storm and it is not without reason that we have a national obsession for him. We wish the bundle of joy a brilliant life ahead with added dollops of cuteness.